A free-standing hammock designed by New Zealand-based company Lujo features in the Dallas Morning News Home & Gardening section. The stand, made of gracefully bowed kwila hardwood, is as good-looking as it is sturdy. 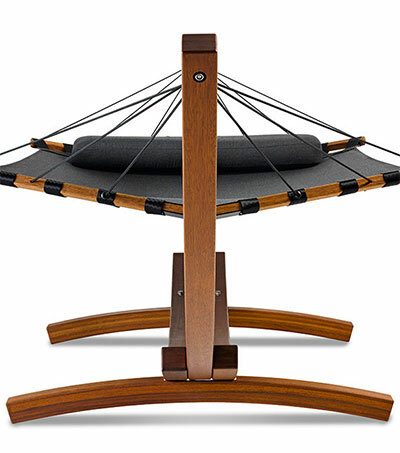 Unlike cheaper hammock stands made of softwoods such as larch, beech or cypress (which typically have a yellow or reddish hue), the chocolate brown kwila wood is durable and able to withstand rain, storms, spills and other ills. The bells and whistles you can purchase are what really elevate the Lujo hammock: attachable side pockets to store magazines, tablets, sunscreen or even drinks, and a portable Bluetooth speaker system that clips to the ropes. Lujo was established in 2007. Original article by Laura Pearson, The Dallas Morning News, July 15, 2015.